A timely exhibition at SALT in the age of wars and revolutions, guns and cameras, governmental control and free reign on social media, focuses on the work of the Lebanese actor, theatre director, playwright and visual artist, Rabih Mroué, a member of the generation of artists who came to prominence in the decade that followed the Lebanese civil war in 1990. 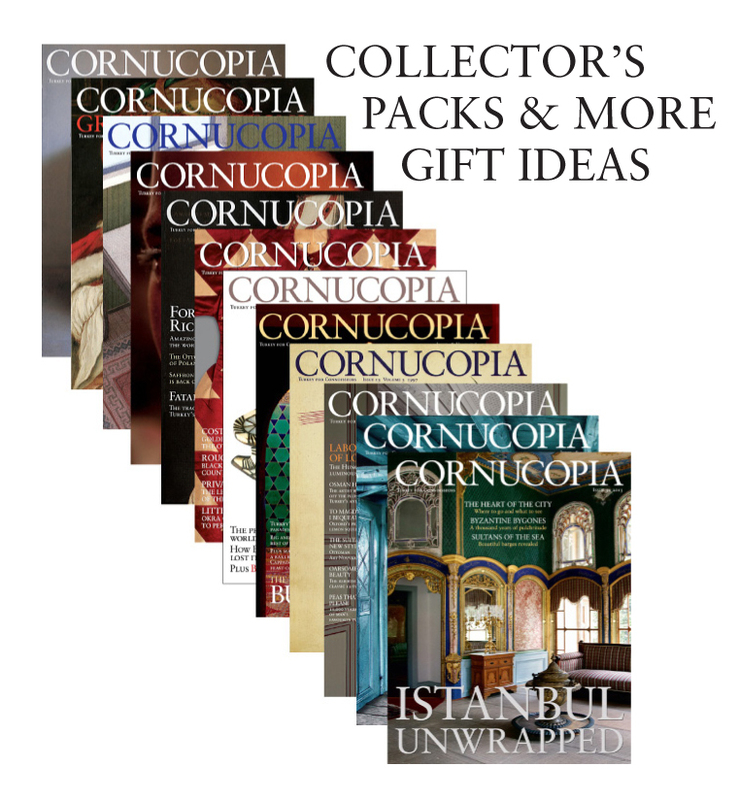 Spread across SALT's Galata and Beyoğlu venues, this selection of Mroué's work spans his recent career. Mroué’s work analyses the effects of war, ongoing conflicts in the region, the social and political implications of images and the writing of history. Evident in much of his oeuvre is Mroué’s penchant for bravura performances, undoubtedly influenced by his background in theatre. In many of the videos, Mroué talks to the camera directly – almost as though delivering a public lecture. In ‘I, the Undersigned’ (2009) (above), for instance, Mroué offers a public apology for acts he committed during the civil war – a simple gesture highlighting the lack of any apology from those actually responsible for it. 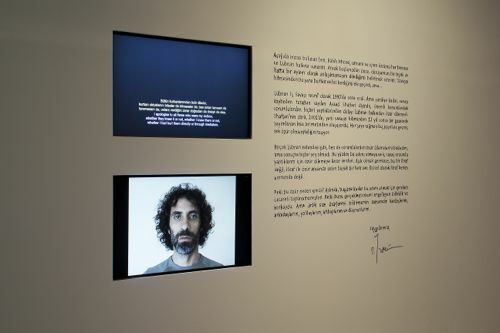 While the works at SALT Galata are based on Mroué’s personal experiences, those addressing social discontent, political demonstrations and social uprisings are displayed at Beyoğlu. 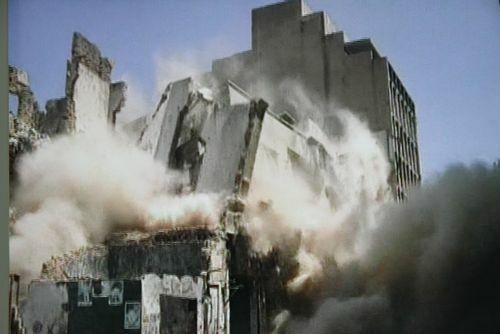 Greeting us when we enter the Galata venue is the work ‘Old House’ (2003) (above), in which the artist analyses different forms of control and suppression in a video effectively combining sound and image. The subtly moving installation ‘Grandfather, Father and Son’ (2010) (above) is the centrepiece of this venue. 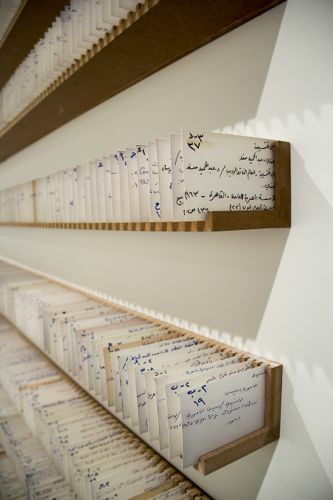 To describe his family’s first-hand experience of the civil war, Mroué recreates a three-part installation: a system of library cards kept by his grandfather to identify his huge collection of books, with pages from a book written by his father and a video of Mroué reading them. This installation was one of the few Mroué chose to discuss at his press conference, underlining the importance he places on this particular work. In a different vein, in ‘Don’t Spread Your Legs’ (2011) (above), Mroué recounts an act of censorship on video to expose the fragility and irrationality of his country’s government and its failure to resolve tensions caused mainly by sectarian divisions. 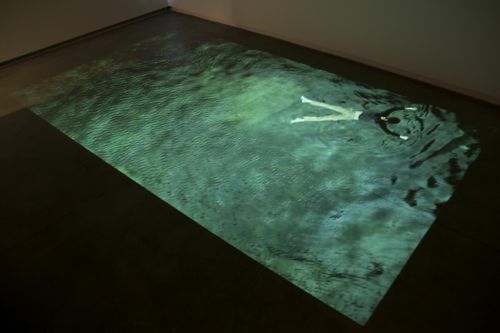 My own favourite work is the video installation ‘The Mediterranean Sea’ (2011) (above), which alludes to the fate of the 17,000 plus people still missing following the war – though that is just one interpretation, says Mroué, who sees this as the most poetic work in the exhibition. There is a different feel at SALT Beyoğlu. The building’s location on Istiklal Caddesi – often the scene of demonstrations, leading as it does to Taksim Square, a focus of political rallies and mass protest – is in itself significant. The display starts with ‘People are Demanding’ (2011), which opens with the phrase ‘Ash sha’ab yurid...’ (The people want to...) – the first half of a slogan first used during the Tunis uprisings and later a popular chant in Cairo’s Tahrir Square, as well as in Beirut and Syria – in spray paint, followed by a list of seemingly random verbs in place of its actual ending, which translates as ‘bring down the regime’. I also like the collection of photos in which Mroué places himself against a backdrop of mass protests. In ‘Leap into the Void’ (2011) (main image), he Photoshops himself jumping into a crowd of protesters, while in ‘Self-Portrait’ (2011) (above), he assumes a comical pose and spouts water from his mouth. These two tongue-in-cheek works underline the celebrity culture which extends even into protests and revolutions (remember the girl in the red dress from the Gezi protests). A few of the works deal with the conflict in Syria, including the powerful ‘Double Shooting’ (2012) (above), set up as a large-scale flip-book installation. 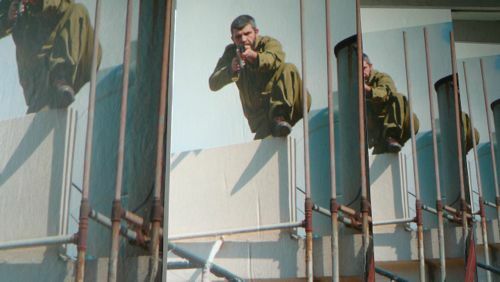 In a narrow corridor are some two dozen mounted photos each a single frame of a soldier shooting from a rooftop. 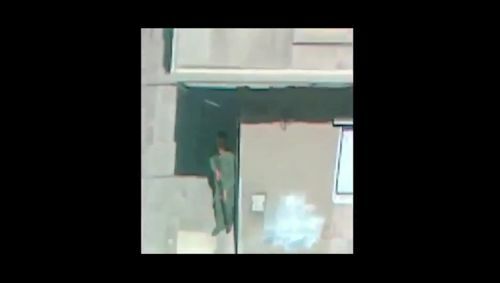 The idea is to walk through the corridor in 18 seconds to get the desired flip-book effect of moving photos showing the soldier shooting at the spectator. This theme continues in the central piece, ‘The Pixelated Revolution’ (2012), a video/lecture that compares shooting a gun with the shooting by amateurs of war and protest footage which is then disseminated on video-sharing websites. The main idea revolves around a cameraman shooting a soldier with his camera being shot at in turn by the soldier with a gun. The 28-minute video ponders interesting issues, but its pace was disturbed for me by Mroué constantly glancing at his notes. It would have been much more effective if he had learnt the script. This exhibition is closely based on another exhibition entitled Rabih Mroué: Image(s), Mon Amour, displayed CA2M and curated by Aurora Fernández Polanco, with a few slight alterations. The exhibition at SALT runs until July 27, 2014.